Just Being Frank: Thank you! Blog readers...You are all incredible - thank you so much for your counter top assistance. I promise you will all be invited over for many parties with food served atop said counter tops. You rock!! Construction is slated to begin tomorrow...pictures to follow. Jeremy and I just returned from a trip to Boston to visit his Aunt, Uncle and Cousins and celebrate their 40th wedding anniversary. We had a great weekend celebrating with them, and I am now back but exhausted. But...I still wanted to post a little something. And this is not sweet to anyone but me, and probably my mom. And Lindsay too. But look at this picture my best friend Lindsay just sent to me. Talk about lifelong best friend. That is a picture of us in her pool, with her dad, for a pool party. I'm the one in the hot two piece bathing suit, attached at the sides, behind her dad. The one with the blazing red hair and freckles, in case you couldn't tell. You guys look so cute in both pictures!!! 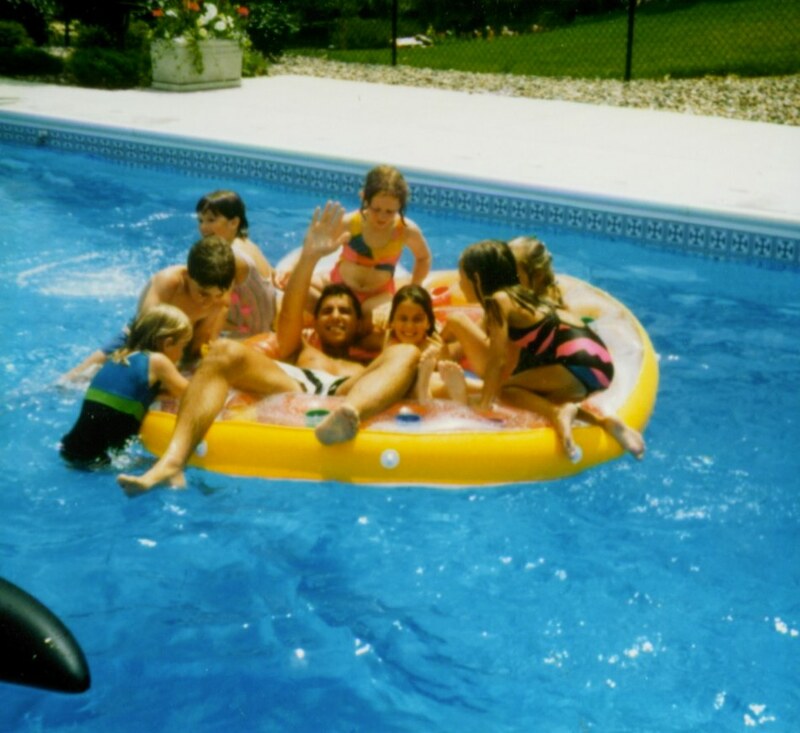 Plus I LOVE that Lindsay's dad is the one is the pool with 10 kids hanging on him and a HUGE grin on his face.